How Can I Honor My Mother & Stepmother in My Wedding? Add an entourage list to honor your wedding party. 2 How Can I Honor My Mother & Stepmother in My Wedding? 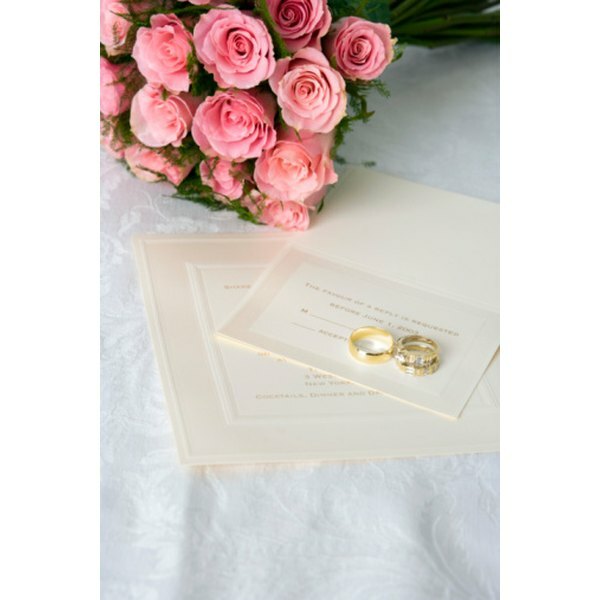 A number of bride and grooms opt to add an entourage list to their wedding invitation to give prominence and honor to the members of the wedding party. This also allows other guests to know who will be playing certain important roles during the wedding. It also lets you know who to approach for particular concerns. For example, if you need to ask the Maid of Honor about the couple's gift registry or the Best Man about the bachelor party, the entourage list is the first place to look. Ask your wedding invitation designer to create a separate sheet for the entourage list, to be included in the invitation suite. Have the entourage page designed to coordinate with main invitation page. The paper can be lighter than the main page though, to distinguish and give more importance to the contents of the main invite. Write the names of the principal sponsors or witnesses first, followed by the secondary sponsors, which might include candle, veil and cord sponsors, if you have these roles in your entourage. Then write the names of the Best Man and Maid of Honor, groomsmen and bridesmaids, followed by the ring bearer, coin bearer and Bible bearer (included in some Catholic cultures such as in the Philippines) and the flower girls. List the names under the appropriate designations as a heading for each role. Use descriptive phrases to introduce and define each role. For example, instead of just writing "Bridesmaids" or "Groomsmen," write something like "To serve as our wedding attendants." Or instead of "Ring Bearer" write "To carry our symbol of love," and in place of "Flower Girl" put something like "To shower our aisles with flowers." If you have secondary sponsors, you can write "To light our path" for candle sponsors, "To clothe us as one" for veil sponsors, and "To bind us together" for cord sponsors. Rose Sartaguda is a freelance writer/creative consultant. A professional writer for more than 10 years, she is also the creative director of Music of My Soul, a nonprofit media organization. What Is the Benediction in a Wedding Ceremony?